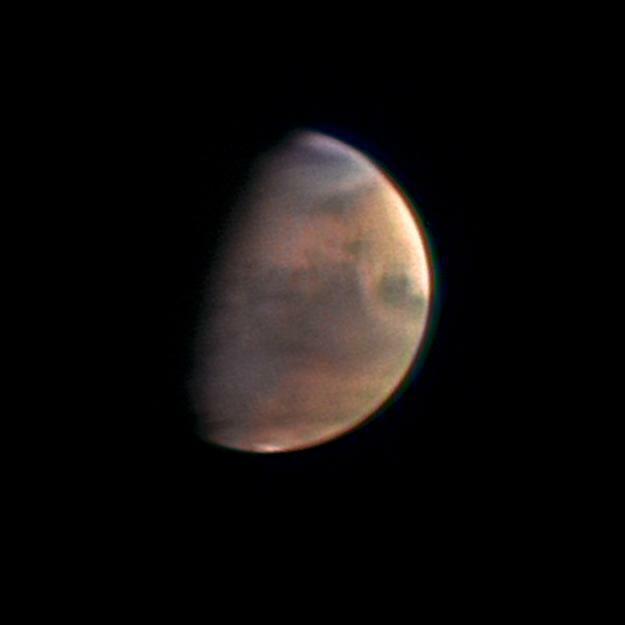 This picture was taken on 1 December 2003 from ESA's Mars Express spacecraft by the High Resolution Stereo Camera (HRSC) under the responsibility of the Principal Investigator Prof. Gerhard Neukum. It was processed by the DLR Institute for Planetary Research, also involved in the development of the camera, and by the Freie Universität Berlin. 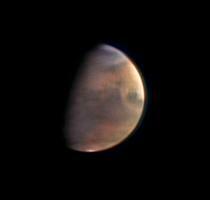 This picture shows planet Mars as seen from a distance of about 5.5 million kilometres. This is a very unusual view of Mars because the planet is illuminated in a way never seen from Earth. The sun shines on part of the western hemisphere, but more than a third of the Martian disc lies in the dark. The dark features at the top are part of the northern lowlands of Mars, where oceans possibly existed thousands of millions of years ago.